The Independence will dock at 05:30 Sunday morning. The Independence will dock at Point Loma Sportfishing 5:30 Friday morning. For those of you leaving on Fridays 3 day trip please be sure to bring your PASSPORTS. The independence will dock at Point Loma Sportfishing 0530 Monday morning. For those of you going on Mondays 5 day trip be sure to bring your PASSPORTS. In going through our upcoming trips we have found several passengers whose passports will expire prior to their trips departure. Please check to make sure this is not your case. Also many of you have gotten new passports and not notified us. When we order out the Visas' for your trip the passport info must match exactly as submitted to Mexican Immigration. We are not allowed to let anyone board our boat unless you have a valid passport in your possession when required. Thank you. Checking in here. Had a great first day of fishing. We got a chance to get everyone warmed up on an afternoon Yellowtail bite! There was good action for all with fish biting the bait as well as good fishing on the yo yo and surface irons. We are headed south in hopes of more fish tomorrow. Allen Smith would like to wish a happy birthday to his beautiful wife Shelly. Happy birthday from all the Indy crew! Great day of fishing for is today. Everyone had their fill on nice Yellowtail along with a nice bonus of Whiteseabass. We are traveling up and fishing offshore tomorrow. Wish us luck. Matt and Indy crew. 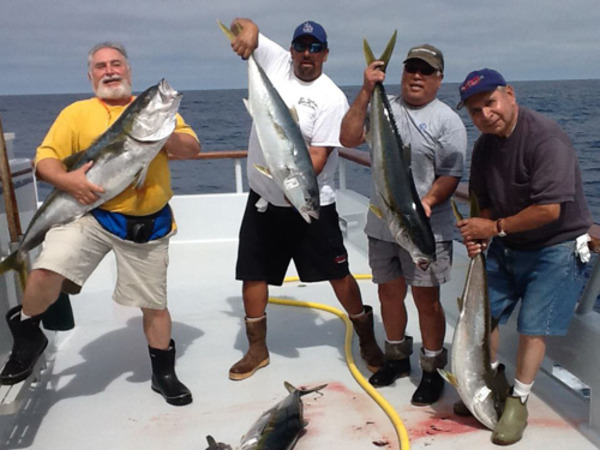 We had a good 2 days fishing offshore catching school sized tuna with more good grade yellowtail and a few mahi. We are on our way up the line and will be at the dock at 0530. What a fun trip with a great group of guys. Thanks to Rick Ozaki for all his wonderful giveaways. Look forward to seeing you all next year.